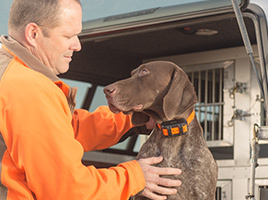 Both the transmitter and the dog device collar are designed to withstand all the blows, bumps and sloppy conditions of training and hunting. The dog device comes with 2 sizes of removable, stainless, insulated contact points for reliable performance in wet conditions and extended comfort for the dog. The dog device is water-rated to 1 ATM(10 meters). 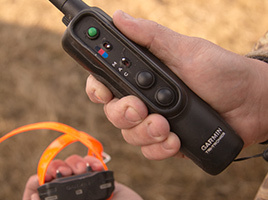 The color-coded dog selection switch on the PRO 550 handheld allows you to determine which dog is receiving correction. Pairing the dogs’ collar color to the color of the selection switch helps you keep track of which dog is receiving stimulation or tone.